cardigans and kids: Christmas candy recipe - peppermint bark. 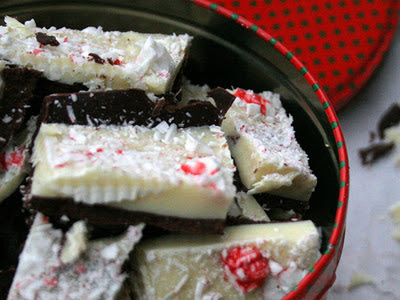 Christmas candy recipe - peppermint bark. I've been trying to narrow down want goodies I am going to make and share with friends and family this Christmas. I first posted this recipe over at www.casnerfamily.com in 2008. I made it last year and I will be again this year as well. Using the microwave to melt the chocolate keeps it simple and fairly quick to make. My one word of warning is that since it is peppermint and smells like peppermint (it will make everything smell like peppermint. :)) before including it in a cookie tin, I would wrap it by itself in saren wrap. 2. Melt the bittersweet chocolate, heavy cream and peppermint extract in a microwave safe dish or on the stove. (You can put it in a metal bowl and set it over a saucepan of barely simmering water.) I used the microwave and would stop and stir the chocolate every 20 seconds to make sure it wouldn’t burn. As you stir, more will melt. 3. Pour the chocolate mixture into the bottom of the the 9×13 pan and spread it around with an offset spatula. Refrigerate for 15-20 minutes. 4. Melt the white chocolate in the microwave or on the stove as above. 5. Pour the melted white chocolate over the cooled bittersweet chocolate mixture and spread around with a offset spatula. (Make sure you cleaned off all the dark chocolate before spreading the white chocolate). 6. Quickly spread your crushed peppermint candies around the top of the white chocolate. Refrigerate for another 25 minutes. Serve immediately or as you cut the pieces, place them on waxed paper and cover. Refrigerate until ready to serve. The peppermint bark should last for up to 2 weeks. I put mine in a ziplock bag after placing onto the wax paper to keep the peppermint flavor to itself.